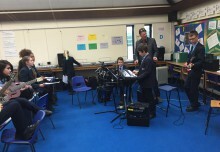 The Finchley Catholic High School Music Department is always a hive of activity with formal and informal learning occurring in every breakout space possible. 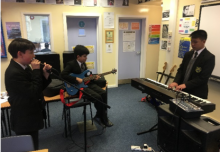 We have two classroom music teachers and 5 peripatetic teachers from Barnet Education Arts Trust supporting our young people, and offer a range of ensembles including rock band, jazz band, choir and keyboard ensemble. Performance opportunities both in and out of school allow for an authentic music experience for our students, and we make the most of our location in North London to experience all that the capital has to offer in terms of art. 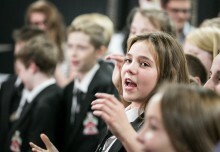 Students have the opportunity to perform at regular assemblies and Masses to support our Catholic ethos, and the Music and Drama department join forces for a biannual musical production for the entire school. 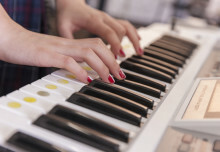 GCSE Music has above average national enrolments, and in an environment where Music is being squeezed out, we are reinvesting in our KS5 musicians by offering BTEC Level 3 from September 2019. We will be the only school in Barnet Local Authority to do this. 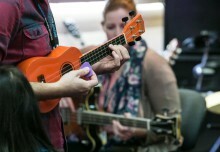 At KS3, all students all students are on a carousel between Music, Music Tech and Drama. The music classroom is inspired heavily by Musical Futures, and we are looking forward to implementing the new technology programme into our Music Tech classroom.